Wildlife protection and translocation works. Reptile and amphibian fencing. Protection is better than translocation, but well planned translocation can deliver excellent results, and is often the initial basis of good habitat creation. We have undertaken a range of contracts, including for South West water and the Environment Agency. This has included moving a sand dune, heathland restoration and reinstatement of a species rich hay meadow. On site tree protection. Mature trees are vital to the landscape and ecology of an area. Safeguarding existing trees on a development may be as simple as fencing exclusion zones, but in confined areas roots can be protected with special cell-based membranes. Remember a third of a tree is below ground! Invasive weed control. We provide specialist herbicide treatment works, including Japanese Knotweed. This service is also available for the crucial early years of new tree planting sites, where keeping trees free of competition from grasses and brambles is vital. Tree planting. We have planted hundreds of acres of woodland for many different landowners, and can also draw up plans and apply for grants towards this work. We specialise is native broadleaved woodlands, but can undertake any scheme, from landscaping a new development through to larger commercial forestry planting. Woodland access construction and maintenance. Good access is often the key to profitable long term management, and will also deliver improved conservation: your new access track can also be a great butterfly ride. Tracks can be built to meet the needs of small vehicles, larger farm machinery or modern specialist harvesting machines. The choice will depend on the size and slope of a wood, and how you plan to harvest timber in the future. Pond construction. 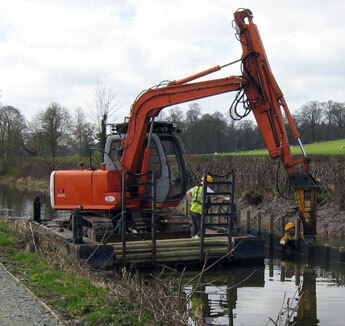 Work can vary from relatively small farm or woodland ponds to much larger areas of habitat creation. We can help you choose the right location, advise on liners and dams if necessary, and handle any legal requirements and permissions required. We will work with specialist experienced plant hire firms to implement on the ground.